When youre operating motor based equipment, energy efficiency has always been a concern, especially when calls for a greener environment are getting louder. If youve yet to explore the option of adding a Variable Frequency Drive (VFD), perhaps you should start doing so, especially after understanding the benefits of doing so. As the name implies, a VFD is a device that controls the speed of an AC motor. A VFD is particularly useful in any application that requires the load to be operated at various speeds. With that said, any substantial energy-saving is only significant when youre not operating above 80% speed all the time. A great example of a VFD application is the supply and exhaust fans of air handlers. Conventional methods use a damper operator to vary the air flow by opening and closing the damper operator. As the speed of the fan remains at full speed, this method is barely efficient. A VFD changes that by controlling the speed of the fan itself. You can save a lot of energy with applications that see great variations in the motor speed. 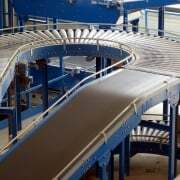 Applications that can benefit from VFDs are typically conveyors, mixers, fans, pumps, elevators and coordinated drives. If youre running a motor at a fixed speed at all times, you may want to be cautious of not oversizing your motor. Aside from real power, a motor also draws reactive power to operate and this can affect the power factor, resulting in higher utility cost. The ideal design is to have the motor running near its rated load at the rated speed. Getting a VFD integrated into a control system should not be a great concern these days. Newer PLCs and controllers feature Ethernet network that allows VFD to be connected directly. This allows the VFD to control the start/stop, forward/reverse and the set point of the motor. In case youre trying to integrate the VFD to an older motor drive where communication port is non-existence, you can easily hardwire the PLC output to the drives input to achieve the same functionality. There are a couple of design concerns that you may want to pay attention to when it comes to VFDs. Youll want to be careful of regenerative energy that coupled back to the AC line created by overhauling load. Adding a dynamic braking resistor across the BRK+ and BRK- terminal will absorb the excess energy in a safe manner. In applications that require your motor to run much at a much higher frequency than its specified rating, the motor will draw more current to stay at the correct speed. This happens because the available torque is dropping off while the horsepower remains constant. Extra precautions may be needed when determining your motor and drive in such situation. We have more in-depth guides and tips in the second part of this article that you may not want to miss out on. Stay tuned and check it out before making your decision with a VFD. Have any questions? Contact us today and our staff will be ready to assist you! Should I Use Fuses Or A Breaker On Variable Frequency Drives (VFDs)? https://www.precision-elec.com/wp-content/uploads/2018/05/Precision-Electric-Logo-Text-Color-115-x-115.png 0 0 Sean Flynn https://www.precision-elec.com/wp-content/uploads/2018/05/Precision-Electric-Logo-Text-Color-115-x-115.png Sean Flynn2018-01-12 16:26:512018-03-27 11:18:37Should I Use Fuses Or A Breaker On Variable Frequency Drives (VFDs)? All Repairs Include a 12 Month In-Service Warranty. Simply submit your quote request using the quote request form and it will generate a packing slip for you automatically. You will receive a copy of this packing slip in your e-mail.